Born September 26, 1888, modernist poet and playwright Thomas Stearns (T.S.) 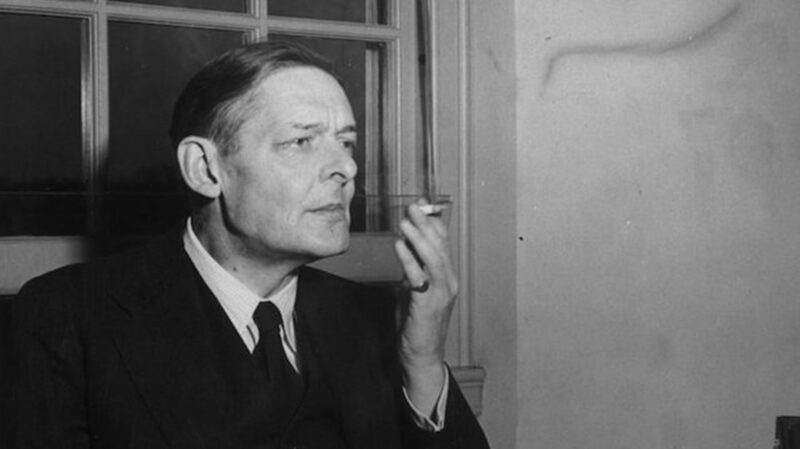 Eliot is best known for writing "The Waste Land." But the 1948 winner of the Nobel Prize in Literature was also a prankster who coined a perennially popular curse word, and created the characters brought to life in the Broadway musical "Cats." In honor of Eliot’s birthday, here are a few things you might not know about the writer. 1. HE ENJOYED HOLDING DOWN "REAL" JOBS. 2. ONE OF THE LONGEST-RUNNING BROADWAY SHOWS EVER EXISTS THANKS TO HIM. In 1939, Eliot published a book of poetry, Old Possum’s Book of Practical Cats, which included feline-focused verses he likely wrote for his godson. In stark contrast to most of Eliot's other works—which are complex and frequently nihilistic—the poems here were decidedly playful. For Eliot, there was never any tension between those two modes: “One wants to keep one’s hand in, you know, in every type of poem, serious and frivolous and proper and improper. One doesn’t want to lose one’s skill,” he explained in his Paris Review interview. A fan of Eliot's Old Possum’s Book of Practical Cats since childhood, in the late '70s, Andrew Lloyd Webber decided to set many of Eliot's poems to music. The result: the massively successful stage production "Cats," which opened in London in 1981 and, after its 1982 NYC debut, became one of the longest-running Broadway shows of all time. 3. THREE HOURS PER DAY WAS HIS WRITING LIMIT. 4. HE CONSIDERED "FOUR QUARTETS" TO BE HIS BEST WORK. In 1927, Eliot converted to Anglicanism and became a British citizen. His poems and plays in the 1930s and 1940s—including "Ash Wednesday," "Murder in the Cathedral," and "Four Quartets"—reveal themes of religion, faith, and divinity. He considered "Four Quartets,” a set of four poems that explored philosophy and spirituality, to be his best writing. Out of the four, the last is his favorite. 5. HE HAD AN EPISTOLARY FRIENDSHIP WITH GROUCHO MARX. 6. EZRA POUND TRIED TO CROWDFUND HIS WRITING. In 1921, Eliot took a few months off from his banking job after a nervous breakdown. During this time, he finished writing "The Waste Land," which his friend and fellow poet Ezra Pound edited. Pound, with the help of other Bohemian writers, set up Bel Esprit, a fund to raise money for Eliot so he could quit his bank job to focus on writing full-time. Pound managed to get several subscribers to pledge money to Eliot, but Eliot didn’t want to give up his career, which he genuinely liked. The Liverpool Post, Chicago Daily Tribune, and the New York Tribune reported on Pound’s crowdfunding campaign, incorrectly stating that Eliot had taken the money, but continued working at the bank. After Eliot protested, the newspapers printed a retraction. 7. WRITING IN FRENCH HELPED HIM OVERCOME WRITER’S BLOCK. After studying at Harvard, Eliot spent a year in Paris and fantasized about writing in French rather than English. Although little ever came of that fantasy, during a period of writer’s block, Eliot did manage to write a few poems in French. “That was a very curious thing which I can’t altogether explain. At that period I thought I’d dried up completely. I hadn’t written anything for some time and was rather desperate,” he told The Paris Review. “I started writing a few things in French and found I could, at that period ...Then I suddenly began writing in English again and lost all desire to go on with French. I think it was just something that helped me get started again." 8. HE SET OFF STINK BOMBS IN LONDON WITH HIS NEPHEW. Eliot, whose friends and family called him Tom, was supposedly a big prankster. When his nephew was young, Eliot took him to a joke shop in London to purchase stink bombs, which they promptly set off in the lobby of a nearby hotel. Eliot was also known to hand out exploding cigars, and put whoopee cushions on the chairs of his guests. 9. HE MAY HAVE BEEN THE FIRST PERSON TO WRITE THE WORD "BULLS**T."
In the early 1910s, Eliot wrote a poem called "The Triumph of Bulls**t." Like an early 20th-century Taylor Swift tune, the poem was Eliot’s way of dissing his haters. In 1915, he submitted the poem to a London magazine … which rejected it for publication. The word bulls**t isn’t in the poem itself, only the poem’s title, but The Oxford English Dictionary credits the poem with being the first time the curse word ever appeared in print. 11. HE HELD SOME TROUBLING BELIEFS ABOUT RELIGION. Over the years, Eliot made some incredibly problematic remarks about Jewish people, including arguing that members of a society should have a shared religious background, and that a large number of Jews creates an undesirably heterogeneous culture. Many of his early writing also featured offensive portrayals of Jewish characters. (As one critic, Joseph Black, pointed out in a 2010 edition of "The Waste Land" and Other Poems, "Few published works displayed the consistency of association that one finds in Eliot's early poetry between what is Jewish and what is squalid and distasteful.") Eliot's defenders argue that the poet's relationship with Jewish people was much more nuanced that his early poems suggest, and point to his close relationships with a number of Jewish writers and artists. 12. YOU CAN WATCH A MOVIE BASED ON HIS (REALLY BAD) MARRIAGE. Tom & Viv, a 1994 film starring Willem Dafoe, explores Eliot’s tumultuous marriage to Vivienne Haigh-Wood, a dancer and socialite. The couple married in 1915, a few months after they met, but the relationship quickly soured. Haigh-Wood had constant physical ailments, mental health problems, and was addicted to ether. The couple spent a lot of time apart and separated in the 1930s; she died in a mental hospital in 1947. Eliot would go on to remarry at the age of 68—his 30-year-old secretary, Esmé Valerie Fletcher—and would later reveal that his state of despair during his first marriage was the catalyst and inspiration for "The Waste Land."